Officially the trails are open until April 1st. All clubs are no longer grooming due to the weather. You can still get some last minute riding in which would be fair. You will encounter icy spots, running water and some standing water so use caution if you are riding for one last time. Thank you for the great season and we hope to see you again next year. Have a great summer. THE GOGEBIC RANGE TRAIL AUTHORITY Monday 25th. I have no new report from the GRTA but grooming has stopped due to the weather. What a difference a day can make! Gogebic Area Groomers have reported that they are done for the season. Warm temps and wet spots are not conducive for grooming. We want to thank everyone who came to visit us this season. Itfs a sad time when we shut down for the season!! We appreciate all those who came to ride and we hope to see you back here again next season!! We have had a several days above 40 degrees. Our trails have a decent base but road trails/crossings and parking lots are bare. Be cautious when riding you may find puddles of open water on the trail. The trails will be icy at night when temps go below freezing. We are done grooming for now due to warm temps. You can still get some late March riding in before the snow goes away!! COME UP AND ENJOY OUR MARCH SPECIALS!!!! Stay Four nights for the price of 3. Stay 2 nights get 50% off 3rd night. Stay with us any time in March and receive a 10% discount. Must reference promo code SNOW19. So what are you waiting for?? Call 800-222-3131 & book your stay with BPLA today! March for 20% off for the Wildernest Chalet after March 17th. WWW.VRBO.COM/1504249. We are a 5 star property that sleeps 10 and a Premier partner with VRBO. We are running a special for the month of March. $50 off per night and $75 off per night from April 1st through May 13th. Vacationers can book directly with us through the Lake Gogebic Chamber of Commerce website and also save an additional $110 per stay by avoiding VRBO traveler fee. Otherwise, vacationers can book directly through VRBO by clicking the link above. Thank you! Hopefully we can bring more vacationers up to the area to support local businesses!! Stay any two nights get the 3rd night FREE at any of our available listingsc.for the month of March. Come check out our super discount rates which are considerably less on our homes. www.thekonteka.com Lindy-906-885-5170 2 night stay get 20 % and the 3 night free. 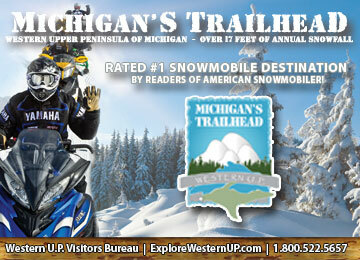 We would like to offer 30% off our daily rate starting March 17 through the end of snowmobile season. Customers can mention promo code wsr2019 to get the discount. Wefd like to offer a small sandwich and Bloody Mary for $13.00 and large Italian beef and domestic beer for $11.00. We also have openings for lodging in the apartment above the bar that sleeps 8. For stays between March 8-31, 2019 only. Not valid for any other month. Must call direct and mention CVB March Promo. 115 Hoop N Hollar Rd. March Daily Specials: Come in and enjoy our March daily sandwich specials through March. March Specials: Come up in March and get 20% of guest room rates through March. Friday and Saturday 2 night minimum. March 10th thru May 10th Lodging Specials: $35.00 per person/nite! any cabin and chalet. Special for new reservations only. We will also be running bar and restaurant specials daily.